On May 1, 2015, I was issued an art challenge, and on May 2, 2016, I finished it. 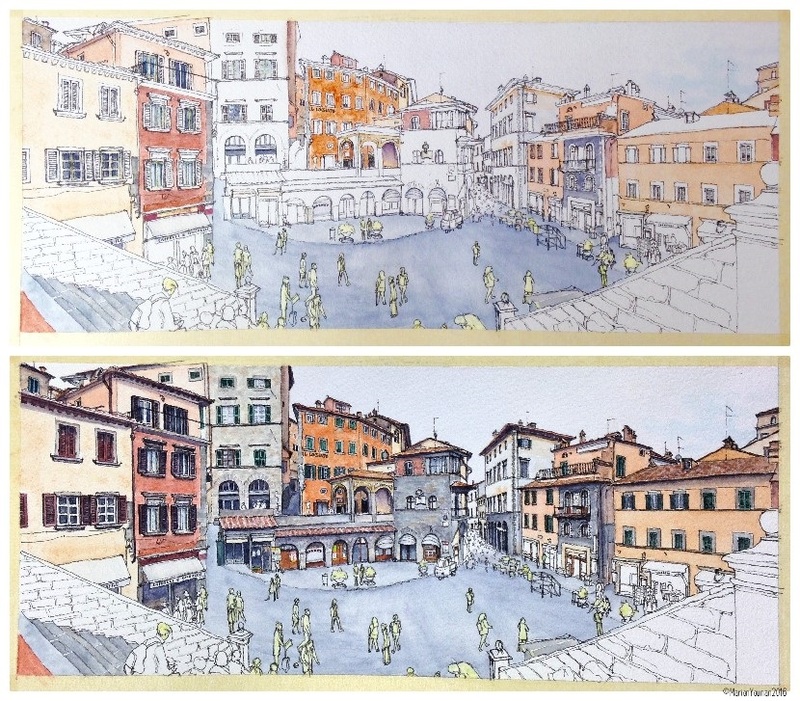 I was taken to the top steps of the Comune di Cortona by Julian Hyzler of Easel and Lens, and was challenged to draw the panoramic view of Piazza della Repubblica. 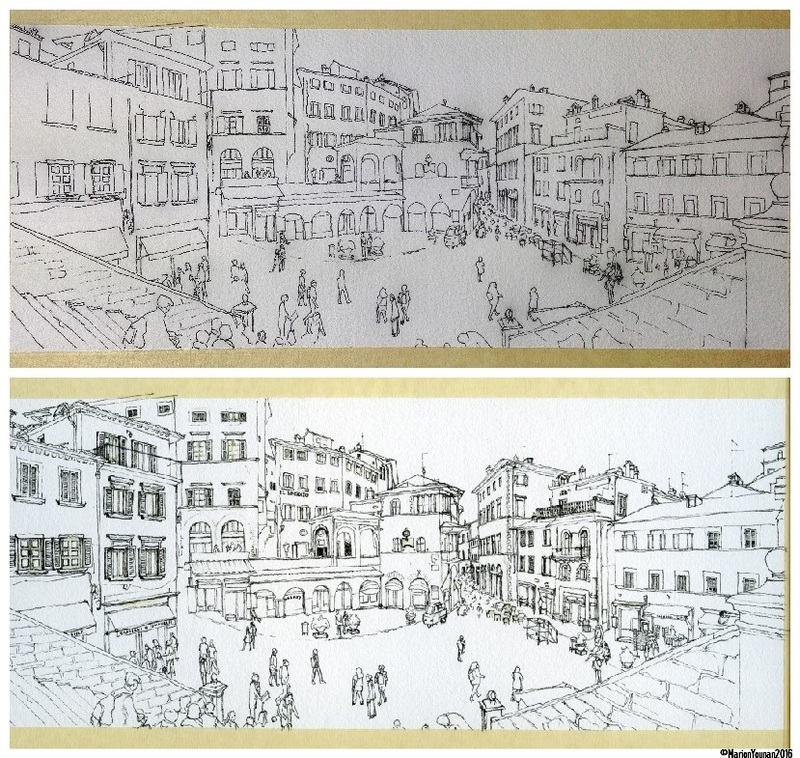 With about 45 minutes left in our afternoon visit to Cortona, I started a rough sketch. And as I posted last July, I didn’t approach this drawing in a calm and methodical way, but instead rushed and made bad decisions that resulted in half a drawing. I grabbed a few photos to continue the job later. That “later” turned into a series of picking it up and putting it down again over the next 12 months. I wish I could say that this stop-start way of working was done intentionally – to await the Art Muses, to mull over next steps, to work only when the studio light was good. Ha! But the truth isn’t as poetic or straightforward. It took me months to figure out that my mindset about this piece had become quite messed up – over time, I had morphed this simple suggestion to stretch my skills into something filled with anxiety. If I wanted to finish it, I had to stop thinking about it as “Julian’s Challenge”, the test, the “betcha can’t do this one”, because it wasn’t positive motivation for my work. Ironically, the first big shift occurred for me a few months back when I decided not to pursue this project any longer because it wasn’t giving me any creative spark or joy – yeah, I gave it up. I moved the outline drawing of the piece on watercolour paper off my easel and onto the floor into my recycling pile, along with all the rough drafts. Anxiety lifted! Then a few weeks ago, I wanted to try out some grey markers, and I grabbed a once-precious rough draft version from the floor and started playing. After a half-hour, I had marked up the whole thing, and it was like I was seeing a whole new possibility for the piece! Shift #2! Thank God I hadn’t ripped up the watercolour paper drawing yet. Mid-April I went back to work on this piece with a renewed vision, and finally a clearer head that this was a piece that I was choosing to make and excited to make, not that I was bullying myself into making. Here are a few photos of the work, finally in progress and to completion! It’s been a really incredible year since I embarked on an art career, around the time I started this piece. I’m still learning so much every day. But I believe the big lesson this project and that this year keeps revealing to me is that I have to remember that creating out of my own joy and pleasure is vitally important. If you’re still with me, thanks for sticking around for this long post! And thank you for your incredible support! This is an absolute delight to see! I really appreciate reading about the background to this drawing and I love how it sparked back to life after you let it go. 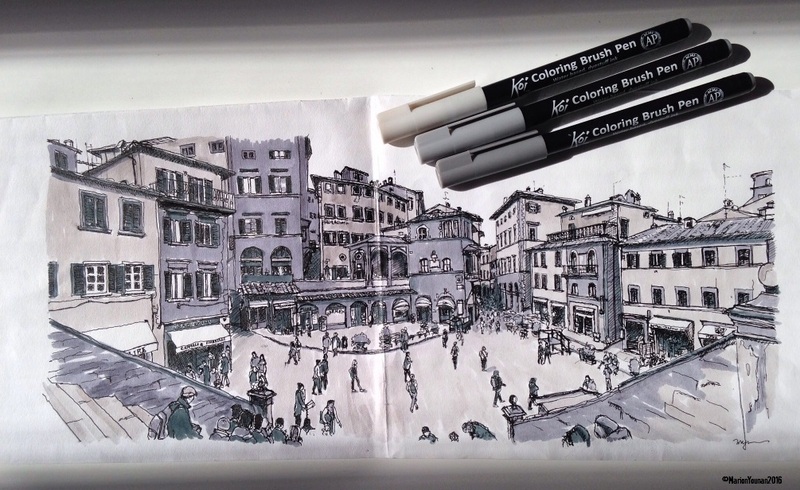 Fab work – gorgeous pen and ink and such rich colours. Bravo! Thanks much, Ronnie! I don’t let too much go, but maybe I should be doing more of it to help my productivity! Ha ha! You are amazing!! So talented! Anita, wow, thanks! Blushing quite a bit right now. Thanks for the encouragement! You are welcome. You really are very talented. Do you sell your work? Its awesome! Yes, Anita, I sell my work. If you go to the “Shop” link, you’ll see the originals I have available – both mini’s and the bigger pieces. Thanks much, Anita! I never considered magazines. Might have to look into that – appreciate the suggestion! You love detail, and therefore I have no doubt why this piece overwhelmed you! I’m glad you finished it…a superb result, Marion, ‘tho I do like the grey markers monochrome version particularly! Thanks, Janina! Yes, I like the monochrome version, too. I’ve taken to making monochrome values thumbnails for my pieces… because it’s a great way to see the values differences, but also I get to play with the pens! Ha ha! Hi. Just had a notion to learn how to draw / paint / write in my (early) retirement and found your lovely site. It’s great! Love Cortona since seeing the film ‘Under The Tuscan Sun’. Visited in Oct’16 with my wife and we had lunch in the restaurant on the terrace in your picture. Fond memories. Feel inspired to continue with my efforts. Thank you. Hi, Mike! Thanks for following my painting and travelling adventures! Sounds like you’ve undertaken a fantastic artistic pursuit, and probably have lots of inspiring photo sources you can use from your trip. Travel got me excited to draw again, too, and now I don’t go anywhere without a sketchbook and pen! All the best!